Made a door this week for a friends pantry. They wanted more easily organised storage and liked the idea of my can rotator door, but don't want to keep so many cans. We sketched up a design with a can rotator on one side and adjustable shelves on the other. Construction was to be simply ply and Planed softwood as the door is going to be painted when it's finished. A key part of these doors is that they have to open outwards and have a fairly substantial fame or lining to fix to to take the weight. 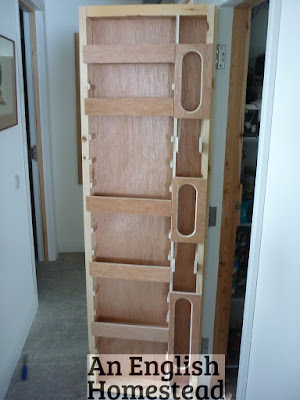 Heavy duty hinges are also a must. Rebating the sides so it'll open without binding on the frame. The cans on the right hand side dispense like the door I made, so you always use the oldest one first. 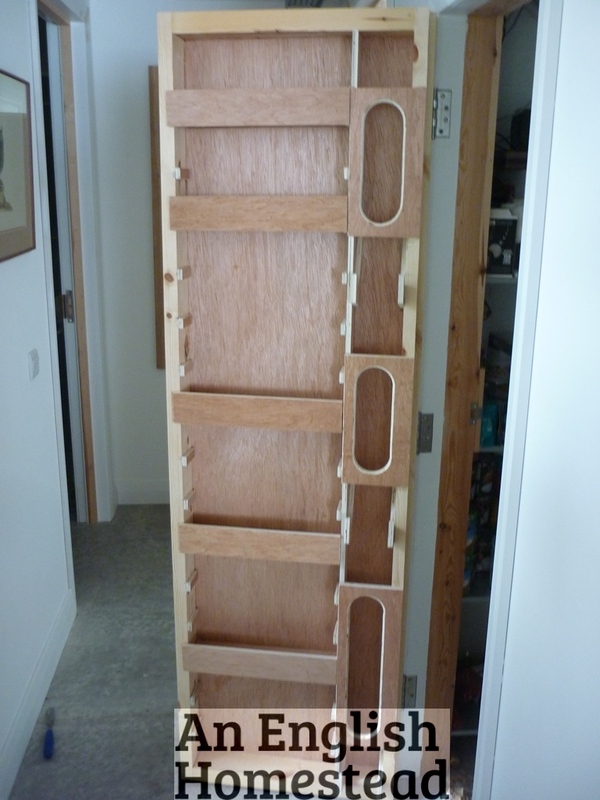 The shelves on the left are fully adjustable to accommodate whatever you want to. They're going to paint the outside in blackboard paint to give a great area for children to draw on and the ply on the inside will probably be left bare. Who else wants me to make them one of these doors? 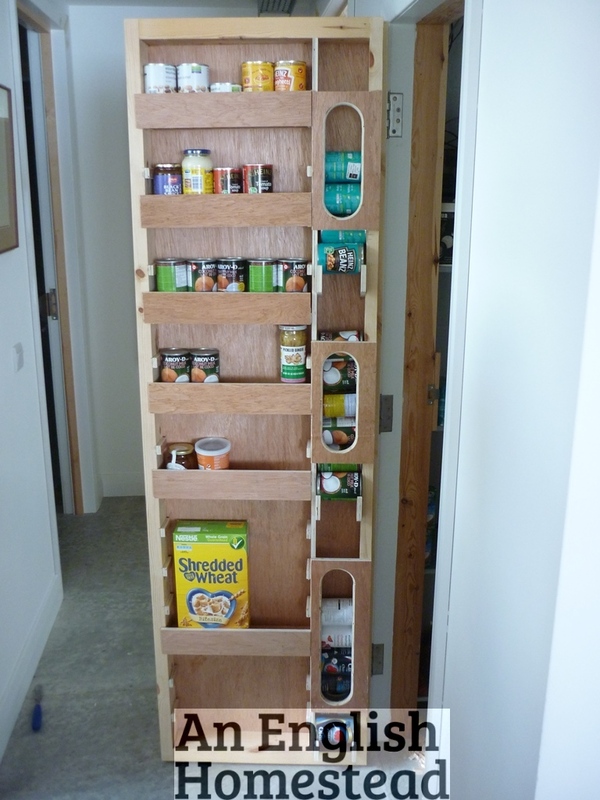 A great way to increase your storage space and to be better organised. I like to encourage everyone to store a little more food. If I had a spare door space, and I was in the UK or you were down here in SW France, I would most certainly book you in for a storage door. It's a great idea, and I hope lots of people book you in to make one for them. I think that your door would make a brilliant shallow cupboard, fixed to a wall with a door on the front. 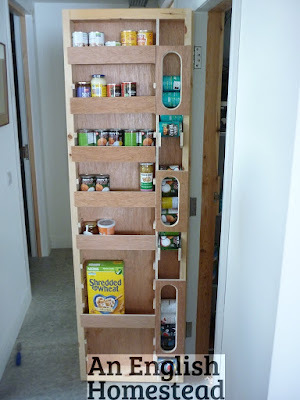 Those tall larder units that are available would hold very little more and take up 3 times the floor space. Brilliant as always Kev! I'd have one if I had a spare door anywhere, but I don't. Pam's idea is a good one too. Your a clever and talented bloke. I think I might have to try making something like that myself. You will have half the homes in the country wanting a 'door storer'! THis is a really good use of otherwise wasted space, you need to patent it.